LAS VEGAS -- With health and wellness continuing to have a strong presence at CES, two big companies announced a partnership to make tracking your fitness easier. On Tuesday, HTC and Under Armour announced HealthBox, a new connected system that works to monitor, measure and manage your health and fitness. The device does some of the same things that other fitness trackers do, but it comes packaged together, working as a one-stop-shop of sorts for getting your health and wellness on track. Inside the box is a fitness bands, a smart scale and a heart-rate monitor. When paired together with a smartphone (the devices works with Android and iOS), you’ll be able to track your health, set goals and get encouragement on how to reach them using UA Record, an app developed by Under Armour. The fitness band is designed like most others to be worn throughout the day, as well as while you’re sleeping. It captures not only your daily activity but also details about workouts you complete and information about your sleeping patterns. Goals can be set directly on the band, and you can view your progress throughout the day to determine if you need to step it up. When paired with the included heart-rate monitor, you can also see your heart rate on the band and in real-time, allowing you to better reach your fitness goals during a big workout. The scale supports up to eight different users, and tracks not only weight but also body fat percentage. Pre-orders for HealthBox start today, with the device set to ship on January 22nd. The complete package, including the heart rate monitor, scale and fitness band is priced at $400. In addition to the HealthBox, HTC also unveiled a few more details about its HTC Vive virtual-reality headset at CES on Tuesday. The updated version of the headset has a more compact design, improved visual system with brighter displays and a new front-facing camera that allows you to blend together the digital and physical world while using the headset. "When we first announced Vive ten months ago we had an ambitious goal of fundamentally changing the way people communicate and interact with the world - forever," said Cher Wang, chairwoman and CEO of HTC, in a statement. "Today we stand on the precipice of a new era. Vive is creating a world where the only limit is human imagination." 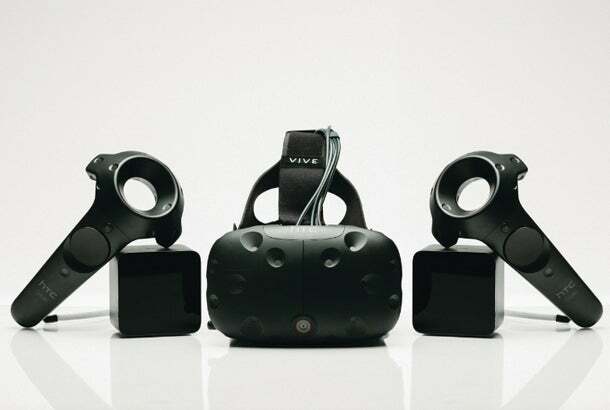 The HTC Vive is expected to be released in April of this year.